Signs of relief were spotted in many Gatineau flood zones Saturday following what officials predicted to be a final significant rise in water levels. Hurtubise Boulevard, one of the most hard-hit roads in Gatineau, reopened to local traffic Saturday after being closed earlier in the week. The street was still partially submerged but larger vehicles and pedestrians were finally able to pass through. Residents told CTV Ottawa the water had receded more than a foot overnight. "It's a very high level, fortunately everyone is safe and sound," said Sylvie Goneau, a local resident and municipal councillor. City crews were also on hand moving sandbags from the area. More than 45,000 sandbags have been handed out to Gatineau residents, the city said. "They came yesterday to see if we wanted to evacuate but we said not its fine," said Micheline Caron, a longtime resident on Hurtubise. More than 20 homes on that street voluntarily evacuated while more than 83 properties across the city of Gatineau were impacted in some way by the floods. Several municipalities, including the Pontiac region, are still operating in states of emergency while residents wait for the water levels to drop. At a press conference Friday afternoon Gatineau's mayor said water levels were expected to rise 5 cm by Saturday reaching peak levels between Friday night and Saturday morning. Water levels, however, are expected to remain elevated or stable for at least the next week. 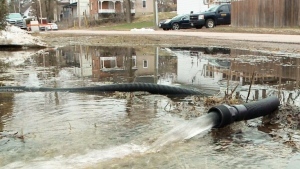 The city of Gatineau said they will begin picking up garbage and sandbags next week. A public information session is being held at 7 o'clock Monday night at Gatineau's Centre Sportif to discuss financial aid for flood victims. Gatineau, along with nine other municipalities, are eligible for emergency disaster assistance from the province of Quebec.